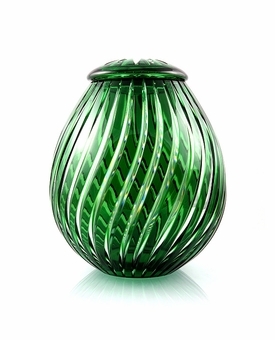 Our Emerald Green Zita Lead Crystal Cremation Urn is hand-made in 24% lead double cased crystal. 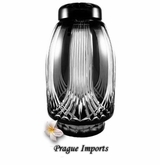 Elegant line cuts follow the contour of the urn. 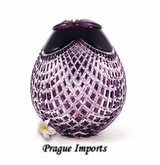 A white satin pouch is included to hold and conceal the ashes. 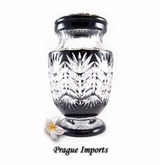 The urn has a top-opening lid that can be permanently sealed with an adhesive (not included). 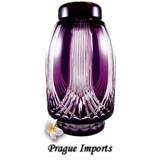 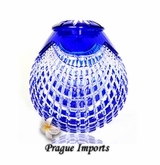 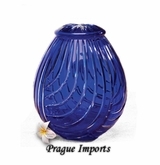 Due to the nature of the materials and the hand-blown process, the colors, patterns and actual dimensions may vary slightly. 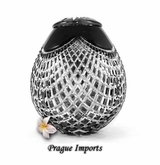 Urn opens at the top. 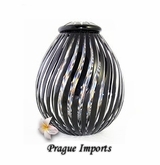 This urn was made in the Czech Republic by Bohemian artists.